That's right friends. 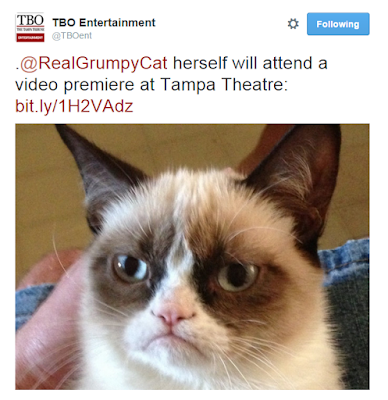 Grumpy Cat is coming to the Tampa Theater on August 4th to attend the video premier of her new video, "Happiness Finds Grumpy Cat". Grumpy Cat, the internet sensation who became the official Friskies® ‘spokescat’ is bringing a kitty entourage join her for the premiere at the iconic Tampa Theatre. Auburn University mascot Aubie the Tiger. The free event will include a screening of the new Buzzfeed video “Happiness Finds Grumpy Cat” starring Grumpy Cat and a dog named Happiness who meet in the aisles of PetsMart. The video, slated for release on August 4, follows a loveable and excitable dog named Happiness who recognizes Grumpy Cat in the aisles of a PetSmart. Happiness tries his best to meet Grumpy as she tries her best to avoid Happiness at all costs. The first 150 people through the doors will receive a wrist band for a meet-and-greet with Grumpy Cat after the screening. Attendance for the event will be capped at 350 people. Everyone who attends will be required to sign a photo release waiver. 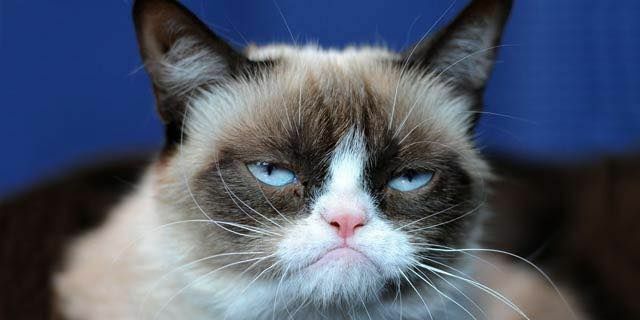 Follow Grumpy Cat on Twitter and Facebook.